I am an avid reader, I have been since I was a little girl. I used to sneak out and sit under an old Granddaddy Oak tree and read. This passion for reading has never gone away, and I am incredibly grateful for it. I literally geek out every time I go to the book store or library. I could spend days browsing books, and quite honestly often have! Especially when I am in Portland, shout out to Powell’s books! I am constantly looking for new and old books and recommendations from friends, family and of course the Good Reads App. The only thing I need is about 90 extra hours a week in order to catch up! Because I am such a fan of books and love getting recommendations, I thought I would do the same for all of you! Each month I am going to release a new book recommendation! Although I have a deep love for True Crime and mystery books, I will do my best to spread it across many genres! The books I will recommend will not all be brand new, many of them you will have heard of before, because at this point I don’t have the access to pre-released books in order to give reviews, swoon…maybe someday! But, I promise that all of the books I recommended are ones that I would tell my girlfriends to go pick up. All of that being said, it only seems right to start the recommendation with your favorite book of all time (so far) right? So that’s what I am doing! Falling under the “Classics” genre, January’s 2018 recommended book is East of Eden by John Steinbeck. For me, this book is all the things. It is a best friend. It is the Grandfather I never knew, a wise old man giving incredible advice. It is a scary villain who takes form in the shape of a mother. It is an homage to the land in my beloved home state of California. It is a family saga, which are always on my list of must-reads. Most importantly, it is the book I reflect on most out of any that I have read. This is why it has been my number one all-time favorite book since I read it in 2010. 8 years as my favorite seems pretty solid! I have recommended this book to every single person that I have ever had a “best book” conversation with. I have been a fan of Steinbeck for years, but it was really this book that made me into a Steinbeck fanatic. There are some minor slow parts, but I found that they were the moments for reflection and lessons learned. Please, do yourself a favor, go pick this up and let yourself become absorbed in it. First published in 1952, East of Eden is the work in which Steinbeck created his most mesmerizing characters and explored his most enduring themes: the mystery of identity, the inexplicability of love, and the murderous consequences of love’s absence. 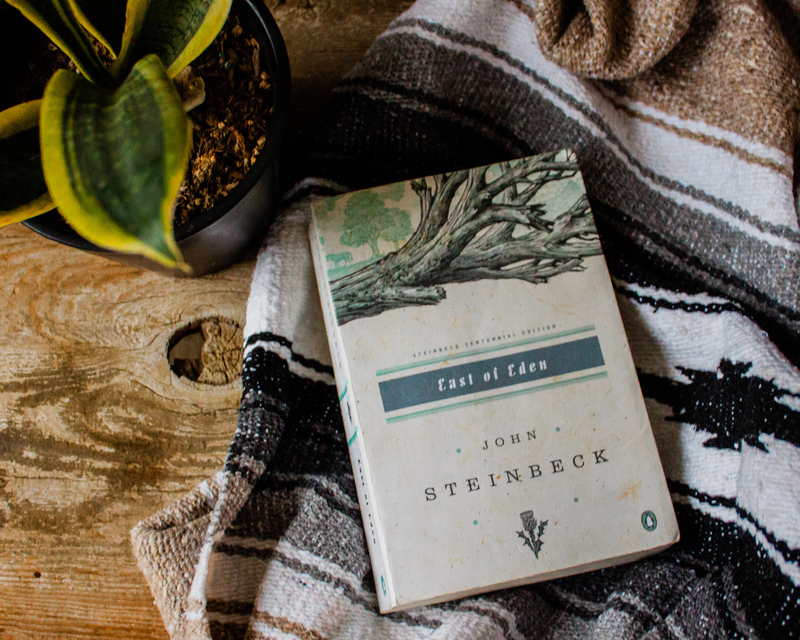 A masterpiece of Steinbeck’s later years, East of Eden is a powerful and vastly ambitious novel that is at once a family saga and a modern retelling of the Book of Genesis. I would LOVE for you to comment and engage with me. Tell me what your favorite books are. Tell me what you thought of the books I recommend. Like I said, I am a huge nerd and can talk books All. Day. Long.